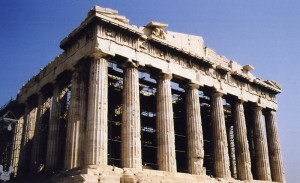 Many of the proportions of the Parthenon are alleged to exhibit the Golden Ratio, a proportion believed to be aesthetically pleasing. Beauty. At first the concept is difficult to define. Instinctively I feel that beauty is real to everyone. Once I have made my mind that something is beautiful I know it in the same sense that I know what the number one is. The natural number does not represent something: one is simply one. Beauty seems to appeal to that same area of our nature, that part that is connected both to the instinctive and the rational. I think of this often in the context of the biblical story of the Garden of Eden. The absence of ugliness in the garden goes together with the absence of evil. The forbidden fruit will bring both evil and ugliness to the life of mankind. The act of disobedience seems to break something in the matrix of human life. Just as God has warned, death is the consequence of disobedience; but before perishing completely man has to experience a fall into a life of ugliness. The garden was good to see; its fruits were good to eat. There is a whole inventory of desirable things that man had in the garden: he could sense the proximity of God and other spiritual beings. He could taste and see that all that God has given him was good. When God brings the animals before him, he starts growing a language that comes from within him, from his feelings and yet that language is connected to a part of creation outside of man, a part that is now being trusted to him. When God names things the very act of naming them makes them come into existence: “Let there be light” results in light. But the naming of the animals is different. Man has to create a symbol in his mind, a second name of sorts, for those creatures that God is bringing before him. God does not reveal to man the primordial names of a bear, a cat, and a butterfly. God allows man to reach into his own soul and find a new name for creation. But is it new or is it something that man has to find within him, something that God has hidden inside man’s soul? Let me return for a moment to our own time. Ages after Adam, we live in a world of remarkable ugliness. While beauty has to be discovered, ugliness is much more obvious. That world once trusted to us, what we generally call “nature,” is being defiled more and more. Our civilization enjoys infusing ugliness into nature: bad music that assaults the ears, architectural eyesores, and colorless dirty cities filled with boarded-up houses. Ugliness is conspicuously all around us. Made in the image and likeness of our Creator, our soul resists being drowned in ugliness. People flee to the suburbs and build new houses or surround their personal space with some measure of beauty. I have seen the inside of houses in the ghettoes of Boston where some beautiful people resisted the invasion of ugliness by making for themselves a cocoon of beauty wherein they could soothe their souls. These days it is amazing how many home-remodeling shows we can see on television. Many people naturally resist ugliness as much as they can. Some rebuild beautiful objects like a classic car, antique furniture, or toys. Those objects remind us of an era when there was much more beauty around us. It seems to me that men and women of today do things like that to reach back to a time where the differences between beautiful and ugly, good and evil where more clear and easy to grasp. Instinctively we know that there has to be a scale of values; that is what we call moral judgments. But the same society that inundates us with ugliness is also telling us that a conception of values is being built. This new system has no clear reference point other than that it must not be built upon religious foundations. This anti-religious attitude—attached to the natural ugliness of the objects it produces—gives us a clue to the connection between morality and aesthetics, between our internal need both for goodness and beauty. The appreciation of beauty requires a form of respect for the way in which the world is ordered. In the simple act of recognizing and enjoying something beautiful we acknowledged that we are not the creators of this world. We realize that there is a proportion that makes things just and beautiful; we notice also that such proportion is external and exists independent from us and yet is mysteriously connected to our feelings and to our need to make a home for ourselves in the world. First God says that it is not good for the man to be alone and decides to make him a suitable partner. Then God brings the animals before Adam so he can name them. The passage seems to intimate that Adam is missing something that he cannot find in the garden. That something that he does not know yet is what will make the garden a home. None of the animals is a suitable partner for man because none of them completes him. Adam cannot find a match for that sense of proportion and beauty that will bring forth in him the need to fully give himself to the other. He can sense God but he can’t see Him. And while he can see and love the animals he shares the garden with, they lack the sameness that he is missing. Without that sameness, without that blessed symmetry there is no possibility for the fullness of love. Adam does not know all of that but he aches to fill that void. The naming of the animals is God’s way to show him that He has placed a sense inside man, a mysterious need for a home that is beautiful, just, and peaceful. A home that will also be made for that other that does not exist yet. Defining beauty is as difficult to us as it was to Adam but now we know that judgments of beauty are profoundly connected with our moral feelings. Along with that comes a strong sense that we should reject ugliness. When we appreciate a painting, music, or food we have a sense of what we ought not to see, hear, or taste. There is a wide area of personal choice where a number of factors influence our taste. Nevertheless there are limits that emerge from us naturally. There are things that we cannot contemplate without a feeling of disgust, there are odors that are associated in our mind with the danger of disease, and there are noises that naturally incline us to joy, sadness, or other feelings appropriate to that particular input. Our senses are the channels God gave us to reach inside us and find that other sense that distinguishes us from the animals, a sense of proportion that is like God’s. Using that sense we realize that a given chord does not belong inside that song or that certain color is the right color for a certain object. That sense is used both to judge beauty and ugliness, good and evil, moderation and excess. Next Article Who Owns Our Jobs?